Recently I have been researching on white wood plank type ceiling with wood beams until my eyes crossed. My goal is to preserved the lovely wood plank ceiling throughout the house. I love the idea of something old, something new, something classic and something fun when the job is completed. The house definitely needs lots of work and updating but preserving certain features within is equally as important. When I am done, I like the kitchen, eating and TV areas to have the feel of picture 4 while the formal dining and living room to have the feel of the last picture. Which is your favorite look? 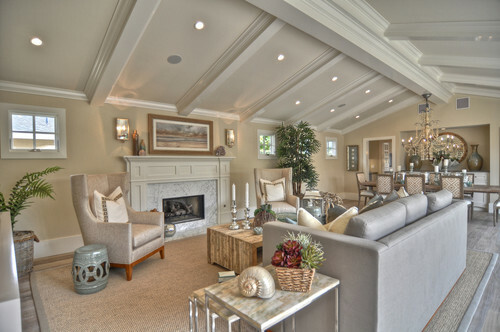 Traditional Family Room design by Philadelphia Architect Archer & Buchanan Architecture, Ltd.